You've probably heard of it, but do you know how it works? Well, whether you're completely confused, or just fancy refreshing your memory, it's time to learn how this fantastic system helps you to get the most of S4 League! The Tiered Spender is the ultimate loyalty reward system. To put it simply; we reward you for the purchases you make. This means that the more you spend on S4 League the more we want to thank you, and we do that by giving you awesome items! Read on and find out how you can take part in what is heralded as the most rewarding event of the game you love. To begin Tiered Spender you must have some AP. You can purchase AP here. Once you have some AP you can begin spending your AP in any of the Item mall outlets, such as the ingame shop or the Web Mall! There's an extraordinary amount of items and boosters that can make your character totally unique! The Tiered Spender does not run forever, that's because the Tiered Spender is a special event that we run for a set period of time. Keeping an eye on the website will mean you do not miss out, because with the incredible rewards of the Tiered Spender you would not want to miss it! When the Tiered Spender launches we will notify the community via the news, forums and the game launcher. From the day it begins you have become a Tiered Spender and any AP you spend will be logged with the Tiered Spender progress bar! 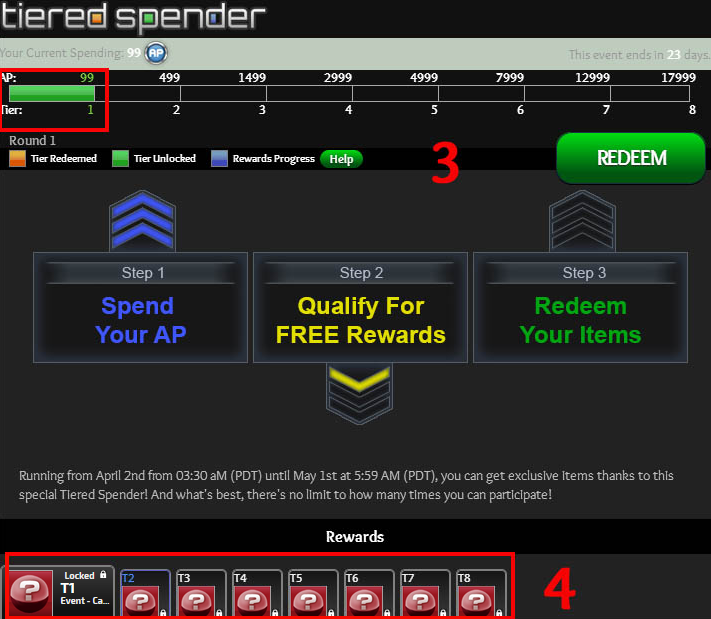 To find the Tiered Spender simply click on the Item Mall drop down menu and select "Tiered Spender". One of the many great aspects of the Tiered Spender is that it will track your spending for you automatically. It will display how much AP you have spent and allow you to keep track of how much more AP you need to spend in order to unlock a Tier. As you continue to purchase the items of your dreams, the Tiered Spender bar will fill up. As you can see the bar is currently blue. It will stay blue until you reach the end of that Tier and unlock it. It's finally come, the moment you have been waiting for; you have unlocked your First TIER! You can be sure of this the bar has turned from blue to green. This confirms you have spent the required AP to unlock that particular Tier. You can read find what rewards await you in each description of the Tiers by just scrolling down! Redeeming your well earned rewards could not be simpler. All you have to do is click the "Redeem" button. Upon clicking this your items will be delivered directly to your inventory and ready for action! 5) But it is not over yet! Remember: Each Tier has bigger and better prizes than the previous one, meaning the further you get, the more exciting and advanced the items you get will be! Also, you will only be able to complete some Tiered Spender events once but sometimes you will be able to complete them multiple times and receive all the rewards over and over again! Reach the last tier to figure it out by yourself! 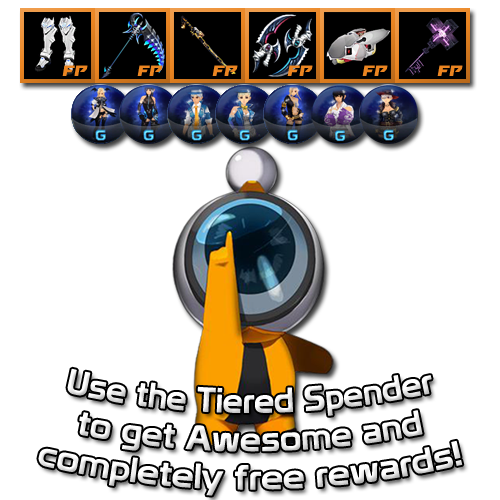 Become a Tiered Spender now and really get gear and goodies worth your AP!